There are plenty of things* that irritate the socks off me when I go into schools to run creative writing workshops, and I'm sure I'm not alone in that! But the object of my ire today is small and soft and, to all appearances, benign. Also evil. Yes, I'm talking about erasers. They are a bane, and I ban them. In the UK, primary school pupils use pencils, a fact which has irritations of its own. When I first started doing workshops in primary schools, I would get the children all enthused and ready to write - straining at the leash - set them off, and then have to wait while 3/4 of the class decided to sharpen their pencil using one of 2 functioning sharpeners on offer. And then, when they did finally get writing, it would be write a word, write another word, write a third word, and then spend 5 minutes rubbing the second word out. Completely out. Utterly obliterated. So rubbed out that resurrection of any sort or variety was impossible. That word was dead and gone. Now I try to head this off at the pass. Before they begin. "Never rub anything out," I say. "If you think a word or a sentence isn't right, just draw a line through it and move on. Keep going. You never know - you might look back and decide that that word was perfect after all." So no erasers. No rubbing out. It's a hard thing to learn, when reaching for the rubber is your default editing tool. But I have no mercy. If I hear that irritating shuckashuckashuckashucka sound, I pounce like a harpy avenging angel pouncey thing. Of course I'm willing to admit that an eraser is a clever little invention, and that it has its uses. Lots of uses. Just keep it away from my workshops! If there are other rubber revilers out there, please know that you are not alone. And one day, maybe, we shall prevail. * for example, tables, about which I rant here. That's not a real rubber. It's one of those synthetic polymanganate things that make lots of noise, don't rub well, and after a while they just look grubby. A real rubber, or eraser to the word pedantics, becomes well worn. And what's the problem with pencils..... ? They lead to queues at the sharpeners whole enthusiasm drains away. Totally agree about both tools! A good (more expensive!) rubber/eraser is a pleasant and useful tool but not at such moments. I'd go for the no rubber, a quick cross-out line and a move into the next words. Pencils? Agree with Sue. Those sharpening queues start up all sorts of social interactions - even while being "quiet" - that take those children's minds off and away from the writing task that you've been carefully setting up in their imagination. You could try a round robin thing in which each child has to write frantically for two or three minutes, then stop and pass it on. No time for rubbing out. It might, of course, be simpler just to supply a sharpener per student via the teacher. I find, as a teacher, that they will often stop to produce a pretty heading and worry about their spelling. The pretty heading is to stave off the evil moment when they have to write something. This is why the round robin is a good warmup activity, plus they enjoy hearing the silly combined stories read out. Each and every lesson is the same - I share your hatred of rubbers! It has a lot to do with lesson/writing avoidance. Children, sadly, would rather sharpen their pencils than write. It's a big bugbear of mine! Strangely, I haven't come across that yet and am very glad for the tip. I will be on the alert, and the moment I hear a scratch scratch of an eraser I will demand that lines will be used instead. That's so much better anyway as they can see all the different versions. I love it when you see the early versions of author's works, and how lines have been altered. I remember when I saw some of Keats' poems and felt very encouraged when I saw that he changed things too. 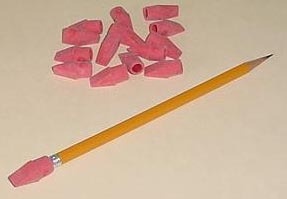 "Please miss, my pencil broke!" Is the answer those mechanical pencils much beloved of mathematicians? And are not mathematicians trained to draw a line through something rather than rub out? I might be wrong about these things but if I am not then...?